The New Jersey based leader in advanced laptops, servers and PCs brings out three new lines at lower prices, representing a 20 Â? 25% drop. CompAmericaÂ?s COO, John Davis, commented on the new product pricing philosophy and its new Â?lead the rest of the pack into the 64-bit zone!Â?. "The results: the Orca 9097 and 7000x, and the Panther 4080x! They are what people want, and now with price drops resulting from their success and demand, they're even more affordable than ever!" added Davis. The company stated that the three new models, the Orca 9097, starting at only $2245, with 17 inch, the Orca 7000x 15.4 inch screen, starting at only $1695, are also being followed with a new 15 inch wide screen sized Centrino model, the Panther 4080x. All models offer SXGA+ wide screen and the ORCA series offer optional UXGA Ultra wide screen LCD displays. ÂOur new, long life, longer battery life Intel Centrino Mobil model is designed to be physically lighter, yet it is PCI-Express technology and will support EM64T from Intel, it will be 64 Bit compatible with later 64Bit mobil Pentium Ms as soon as Intel releases them, with only minor adjustments to the system bios. As you can see, CompAmerica is positioning itself as 64 Bit Ready in the mobil arena! All of our Desktop PCs and Servers already are. However, as to the Panther, there is a first here. It is also the first Pentium M laptop to enter the market with a Centrino 533 architecture AND a PCI Express video adapter, instead of the conventional Intel shared memory adapter commonly found on some Centrino systems!Â added Davis. "Today, Graphics adapters govern much of the speed of the average PC or Laptop. UDMA (shared memory) video is good for business applications and average internet browsing and the occasional viewing of a multimedia presntation. But you really need Graphics muscle in order to get the full benefits of Microsoft's approach to graphics, which at the high end leads to Media Center Edition 2005, a new variation of Windows XP Pro. Media Center uses a lot of muscle in the video and audio and TV playback and recording areas so that the user has the finest multimedia experience possible. Without sufficient graphics power, speed, storage, media components and memory, you really can't call your laptop a 'Media Center' laptop. So, in keeping with what consumers want, we have made certain to include this important feature set in our plan for these three laptops. I'd like to stress that we try and offer a degree of choice, with two or three different adapters the user can select from, at the high end"
CompAmerica offers three video choices on it's highest end laptop, the Orca 9097. A new Quadro FX Go 1400 PCI-Express 16x Video Adapter is optional on the Orca 9097, which replaces a standard ATI Radeon x800 Mobility PCI-Express 16x video adapter at the buyer's discretion. For those with gaming in mind, an optional nVidia Go 6800 PCI-Express 16x video adapter is offered to round out the product. The x800 and Go 6800 are the sole choices on the new Orca 7000x series, which features many of the same features as the 9097, in a 15.4Â wide LCD Screen form factor. CompAmerica indicated it was considering offering a Quadro FX Go 1400 option for the 7000x in the coming months. The Orca 9097 supports up to two (2) hard disk drives, Raid 0/1 and up to two CDRW/DVD or DVRW+/- Dual Layer Burner Drives. The Orca 7000x however, offers a three bay design with a single internal HDD and single internal optical (DVRW) device, and a swappable floppy bay which allows a second battery to be inserted for long commutes. "Again, we felt that the 64 bit computing arena wanted choice, and Raid 0/1 hardware makes it possible to achieve higher speed by striping the Windows volume across two drives, allowing simultaneous reads and writes, at faster rates. The ORCA is not your common laptop, it really does lead the field," mentioned Davis. Both ORCA models are said to support up to an Intel Pentium 4/LGA-775 3.8GHz+ 1M or 2M L2 Cache CPU (or faster) and support ÂextremeÂ editions of these CPUs when they become available. Both models can include an optional Wireless 802.11 b/g/a adapter (internal) with or without optional Bluetooth, and an optional TV Tuner with or without support for Microsoft Windows XP Media Center Edition 2005's remote control features. Both include a Subwoofer speaker kit supporting 5 or 6 internal speakers, digital surround sound and a microphone. "Then came the quandary of how to produce a more mobil, longer battery life 'next generation' laptop with Intel's Centrino Mobility, and advanced features. Our engineers worked long and hard and came up with a slim, sleek and fast 15 inch widescreen model that is 64 Bit ready if Intel chooses to offer a 64 Bit Pentium M CPU." continued CompAmerica's Davis. CompAmerica's new Panther 4080x, the Centrino-based model, supplies the new 533MHz based Intel Mobil Dothan Pentium M CPU at up to 2.13GHz (or faster), with 2MB L2 Cache. Its 15 inch wide screen form factor is supported by an ATI Radeon x700 Mobility PCI-Express 16x Video adapter, for maximum speed and longer battery life up to 8 hours between charges. Prices for the performance leading PANTHER Centrino starts at $1495. 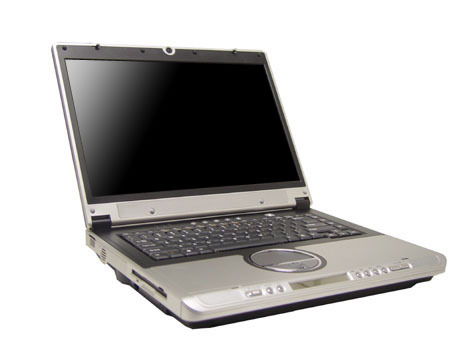 All of CompAmericaÂs laptops support a single or dual 40 to 100-GB 2.5Â high performance mobile hard drive, two to four USB 2.0 ports, firewire, internal wireless, Windows XP, and have an optional 4 Year Extended Warranty. The new Orca models are also said to offer SATA hard drive capabilities. Founded in the early 70's, CompAmerica is a leader in innovative distribution, design and technical support. Its award winning website features unique combination of direct customer interaction and support, with a vast catalog of over 280,000 different PC related and Electronic products in an electronic setting. Customers receive their own dedicated shopping 'intranets', and are assigned a private, dedicated System Engineer to insure that they receive top notch technial support 24x7 without the long wait ordinarily attributed to international call center based help desks. CompAmerica's four year extended warranty is backed by the giant electronics concern, Philips Maganavox. For more information, contact the CompAmerica at 908-931-1200. ORCA 7000x LaptopThe Orca 7000 features a 15.4 inch WUXGA Screen, Pentium 4 of 3.8GHz, 64 Bit design, and Advanced Multimedia.